This spreadsheet study will extend the previous period’s ending VWAP values into the current period. This study works on intraday charts and historical charts using any of the VWAP Time Period Types (except Seconds). Set the Time Period Type in cell J1 to match the Time Period Type in the VWAP study settings. 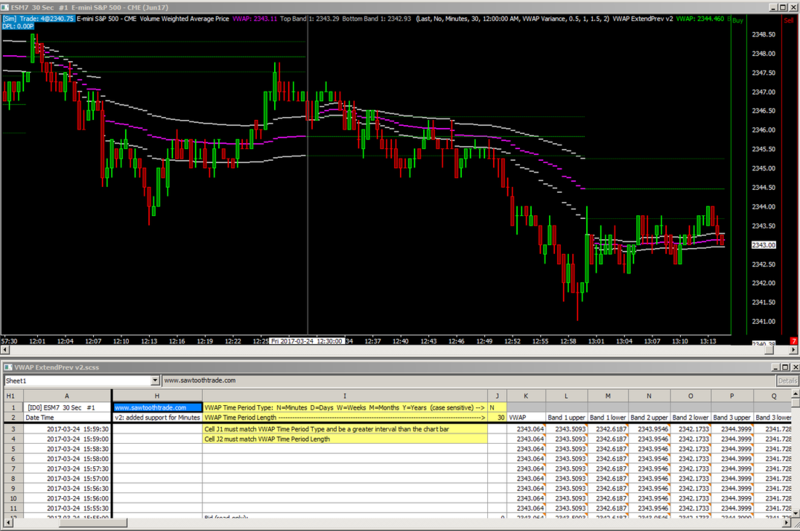 Both the VWAP Time Period Type and cell J1 must be a greater interval than the chart bar. Set the Time Period Length in cell J2 to match the Time Period Length in the VWAP study settings. The default subgraph settings show only the VWAP and the first band. If you want to see the other bands, set the Draw Styles of the other subgraphs to something other than Ignore. The study collection will load the correct spreadsheet study with the correct settings, and it will add an instance of the Volume Weighted Average Price study. If you already have the VWAP study added to your chart, you can remove the instance this study collection adds. The formulas on the spreadsheet assume the VWAP study appears in columns AA-AI. Either move the VWAP study to the top of the Studies to Graph list, or edit the formulas in cells K3-S3 to reference the correct VWAP columns. This spreadsheet’s formulas are built on Sheet1, which corresponds to Chart #1. If you apply this study to a different chart number, you must copy the contents of cells I1-J2 on Sheet1 to cells I1-J2 of the corresponding Sheet#. v2: added support for Minutes period type.